Rodney Hood finds himself moving from one of the most tumultuous teams, the Renardo Sidney-led 2011-12 Mississippi State Bulldogs, to one of the most stable programs in Duke University. Hood was highly ranked coming out of high school (#26 according to the 2011 RSCI but didn't find the level of success he hoped for in his freshman season. Hood has not played in over a year due to the transfer and is coming off an [url=http://espn.go.com/blog/collegebasketballnation/post/_/id/87112/achilles injury , sustained in the tryout process for the USA Basketball Men's University Games. He enters his redshirt sophomore season with a loaded Duke recruiting class and hopes to see an overall improvement in his production. A smooth, lanky lefty standing 6'8 and weighing around 200 pounds, Hood has average length, sporting a 6'8 wingspan on his lean frame. He has good speed, allowing him to get up and down the floor quickly but didn't show great explosiveness his freshman season. He won't wow scouts with his athleticism, so he will need to show more refined offensive skills after being out of the spotlight for nearly 18 months. Hood was primarily a jump-shooter at Mississippi State, with 80% of his shot-attempts in the half-court coming off jumpers. Hood was absolutely deadly in catch and shoot situations behind the 3-point line, shooting 46.9% in these situations while averaging 1.39 points per possession, according to Synergy Sports. When guarded, he likes to give the defender a ball fake, take one dribble and shoot a midrange jump shot. Just an average ball-handler and overall shot-creator, he didn't get to the rim all that often as a freshman, turning himself into somewhat of a one dimensional player. Scouts will want to see whether he has evolved his game from simply an outside shooter to a more dynamic all-around offensive player. Not possessing an explosive first step, nor a great deal of advanced ball-handling moves in the half-court, Hood nevertheless has room to improve on his floor game. He has a nice feel for the game and always seems to be under control with the ball in his hands, as he averaged 2.4 assists per 40 minutes pace adjusted to only 1.1 turnovers per 40 pace adjusted. He contributes to his team's ball-movement and does a good job of entering the ball into the post. Hood is comfortable driving both to his left and to his right, even if he rarely gets all the way to the rim, although drives to his right usually end with a cut or spin move to get back to his favored left hand. Defensively, Hood has the ability to guard multiple positions, although he projects best as a small forward. He uses his length and quickness to slow down offensive players in one on one situations and moves his feet well to make it difficult to get around him. Hood's biggest issues defensively revolved around his lack of intensity and tendency to play at half speed at times. He struggles in defending screening situations, as he gets caught up in the screen as he attempts to fight over the top. When he gets screened, he often gives up on the play, taking himself completely out of the resulting action. Hood will turn 21 in October, which makes him old compared to his peers as he enters his second collegiate season. Scouts will want to see whether Hood used his redshirt season to get into the weight room, as some added strength will help him on both ends of the floor. A boost in bulk will help him become a better finisher at the rim in traffic and give him the necessary strength to defend players of his size. Coach Krzyzewski is one of the best in terms of establishing roles for his players, as well as adapting his strategies to fit the strengths of his team. 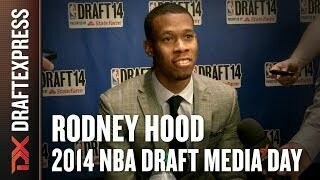 Hood will be joining a team filled with several players with similar skill sets, such as Jabari Parker, Alex Murphy and others. He may be called upon to become more of a ball-handler to fill a team need. Hood will need to balance his established role at Duke, whatever that ends up being, with his desire to show an expanded offensive game to scouts. Since Hood hasn't seen the court in a game setting in over a year, it's hard to assess his NBA draft prospects at this point. As long as Hood doesn't fall back into the trap of taking plays off or not finishing plays, he should find himself as a key member of the Duke rotation, as it's difficult to find many players his size who can shoot the ball as effectively as he can to go along with a good feel for the game. This will give him the opportunities to show what he can do to NBA scouts on a big stage night after night with one of the top teams in the nation.